→Marcos Jr: Watch out, I’ll be back! 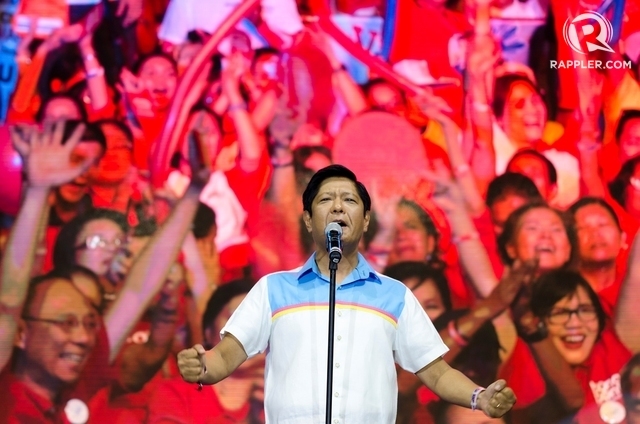 MANILA, Philippines – Former Senator Ferdinand Marcos Jr said on Monday, November 7, he had been going around the country despite his defeat in the vice presidential election, vowing to make a political comeback. The only son and namesake of the late dictator talked about his “resurgence” in a speech at the 80th anniversary celebration of the National Bureau of Investigation (NBI), a day before the Supreme Court (SC) was to decide on petitions to prevent a hero’s burial for his father. At the NBI event, Marcos likened himself to Senator boxer Manny Pacquiao, and borrowed the slogan of the basketball team Ginebra. “Kumbaga sa Ginebra, ‘never say die’ dapat! ’Ika nga po ng tema ng laban ni Senator Manny Pacquiao: resurgence. Babalik po tayo. Babangon at babawing muli tayo. Marami pa tayong ibubuga. Pansamantala lamang po ito. Abangan ang susunod na kabanata!” he was quoted in the press release sent by office. The young Marcos’ speech also came a day before he and President Rodrigo Duterte were both set to visit Tacloban City , the home city province of Marcos’ mother Imelda Marcos, for the 3rd anniversary of Super Typhoon Yolanda (Haiyan) that almost wiped out the city. Their offices separately advised that they would be at the Holy Cross Memorial Park for a 3 pm program. 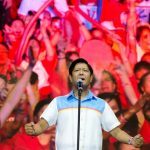 Recently, in his state visit to China where Marcos Jr was present, Duterte introduced him as the potential new vice president in the event his electoral protest prospered. Marcos said he had been going around the country to thank those who supported his vice presidential bid. “And so, I roam around and personally convey my appreciation of their trust in me. Kahit ako ay ‘off-duty’ nang pansamantala, ito ay aking ginagawa dahil kailangan kong tumanaw ng utang na loob sa sambayanang Pilipino. Maraming salamat po sa inyo,” he said. “Kailangang-kailangan po natin ang NBI, lalo na sa ating panahon ngayon na napakaraming banta sa lipunan. Maraming nanggugulo ngayon at naghahasik ng lagim sa lipunan. Gustong takutin at guluhin ang isipan ng taumbayan upang mawalan ng tiwala sa ating pamahalaan,” he is quoted in the press release.